General Characteristics: Medium in height to tall, slender, erect, maturing in about 12 months, producing from 2 to 5 oha; characterized by broad purplish-black stripes on dark green petioles. Petiole: 75 to 90 cm. long, dark green with broad purplish-black stripes especially near base, with light pink to whitish edge, purplish-red at apex, white at base with livid brown for 3 to 4 cm. above. Leaf blade: 35 to 50 cm. long, 25 to 35 cm. wide, 25 to 35 cm. from tip to base of sinus, sagittate, thin in texture, dark green; margins slightly undulate; piko purple; veins reddish on lower surface of lobes; lobes acute with narrow sinus. Corm: Flesh white with yellowish fibers; skin yellowish with purple leaf scars. Origin, and derivation of name: Native variety; derives name from dark striping of petioles. Distribution: Limited; grown equally well under upland or wetland culture. 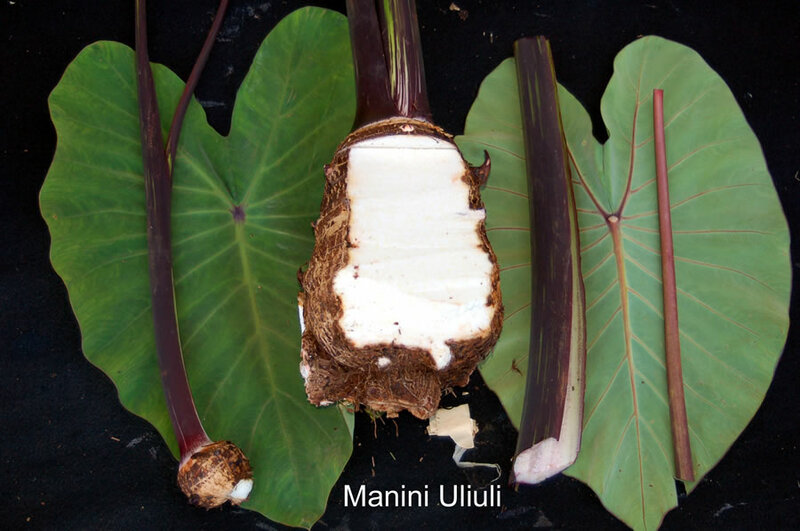 Use: Chiefly as table taro; makes poi of fair quality. Remarks: The petiole stripes are less interrupted than in other striped varieties and very broad, especially at base, often coalescing to form purplish-black blotches.